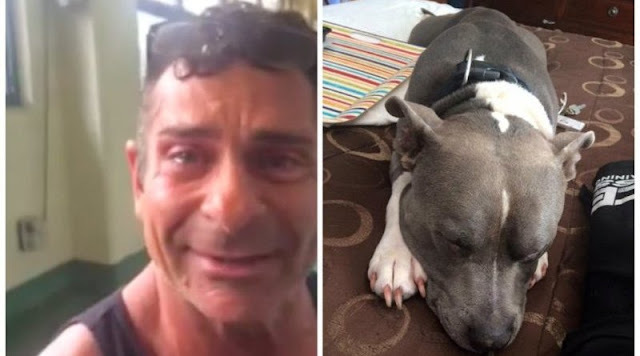 Man tearfully reunites with his stolen dog two days before he was scheduled to be euthanized! Barry Gearhart’s beloved pit bull Titan was stolen from the back seat of his truck a year ago. He says the day. Titan – pit bull went missing was the worst day of his life, and he had cried many nights since then. Although Gearhart couldn’t find Titan, he never lost hope that he’d see his furry best friend again one day. A year had gone by, but Gearhart still never stopped searching for Titan. He posted a picture of him on his Facebook, hoping someone could help find him. That’s when a volunteer at a shelter saw the picture and thought a pit bull at her shelter looked just like Titan. The dog at the shelter, who they named Hank, was elderly and attended socialization classes, but they couldn’t get him to behave the way they wanted. He was scheduled to be euthanized in two days. Gearhart immediately went to the shelter and quickly found out that “Hank” was actually Titan! Their heartwarming reunion was caught on camera, and Titan recognized his human right away. Thankfully Gearhart decided to post that picture of Titan as a final effort to find him, or else he wouldn’t be here today.